Scientists know that the amorous architects of the bird world build three basic kinds of bowers: “maypoles,” “mats,” and “avenues.” But only now are they beginning to discover the reasons behind the existence of these different forms. Mat, or platform, bowers are among the simplest: thick pads of plant material ringed with ornaments. One mat-builder, Australia’s Tooth-billed catbird, builds what is known as a “circus ring” by arranging silvery leaves around the mat, like the petals of a disheveled flower. The bird constantly removes withered leaves in favor of fresh, shiny replacements. The more ambitious maypole bowers are twig towers built around one or a few saplings in a carefully groomed courtyard. The Golden bower bird even perches on a roofed bridge suspended between towers. And four other kinds of maypole builders surround their creations with lawns of moss. Avenue bowers, such as the Satin bower bird’s, featured on NATURE, have two close-set parallel walls of sticks that sometimes arch over to create a tunnel. In a rare example of a bird using a tool, Satin and Regent bower birds may use a leaf or twig to paint the inner walls of their bowers with a stain made from chewed plants, charcoal, and saliva. 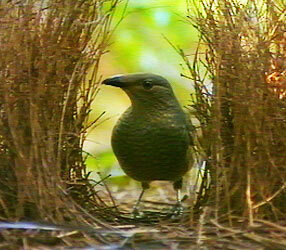 A female bower bird considers her options. Gerald Borgia, a University of Maryland bower bird expert, believes the different kinds of bowers all serve essentially the same function: to make visiting female bower birds feel comfortable by protecting them from overeager males. Courtship rituals, he notes, almost always involve males and females standing with the bower between them, like a fence. In the case of the maypole-building Macgregor’s bower bird, for instance, the courting pair warily circles the central tower. Only when the female chooses to stop and allow the male to approach can mating occur. “The bower probably started as a protective device,” Borgia concludes. “It allows females to get close enough to get a good look without feeling threatened. The male that builds something that makes the females feel most comfortable is likely to see more females.” Borgia has also detected a relationship between bower type and intensity of the male’s display. The male Spotted bower bird, for instance, builds a wide straw wall and performs a relatively energetic display full of dance steps and dramatic poses. In contrast, species building smaller barriers have toned-down displays that are probably less threatening to females. 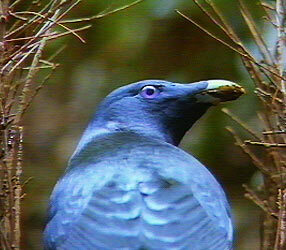 A male bower bird checks his handiwork. Other researchers have noticed a link between the showiness of a bower bird’s plumage and the intricacy of its bower: in general, the drabber the bird, the fancier the bower will be. Some believe this reflects an evolutionary choice: drab birds compensate for their dull appearances by building flashier nests. A male bower bird checks his handiwork. Borgia has also noticed that bower complexity sometimes varies with topography. For instance, species living on hilltops build more modest bowers than those living in valleys. The explanation, he says, may be the amount of light that penetrates the forest in the two kinds of habitat. Ridge tops are often shrouded in clouds, allowing only dim light. Hence, to best show off their decorations, bower birds living here may build more open bowers to make best use of available light. In contrast, light is less of an issue in the valleys, so bower birds can afford to have more elaborate roofed structures. Surprisingly, Borgia has found that bower birds that build similar-shaped bowers aren’t necessarily closely related to each other. Using a DNA fingerprinting technique, he and his colleagues drew a family tree for bower birds that showed their evolutionary relationships. It suggested that species that evolved at different times have independently learned to build similar kinds of bowers, possibly because they faced similar kinds of environmental conditions. But close observation can reveal important differences in the seemingly-similar structures, Borgia says. Where one species may build its bower from the bottom up, for instance, the other may start a similar structure at the top and build down. Similarly, some species put the entrance to their bowers on the uphill side, while similar structures built by other species face downhill. Nobody knows whether young bower birds learn such practices from their elders, or whether they are encoded in their genes at birth. It is a much-debated question that Borgia hopes to answer in future studies by rearing native males in captivity with and without mature tutors.